The Model DOZ01 Flow Sensor with oval rotor assembly measures the flow of liquids ranging from water to those with a maximum viscosity of 200 cSt, regardless of the actual viscosity of the liquid. In this type of sensor, the flowing liquid sets two toothed oval wheels within a measuring chamber in rotary motion. The rotary motion is detected by a Hall sensor and output as a series of pulses. The output frequency of these pulses is directly proportional to the flow rate. Alternatively, the pulsed output can be converted into an analog signal (4 to 20 mA) or into two limit contacts by optional downstream electronics. 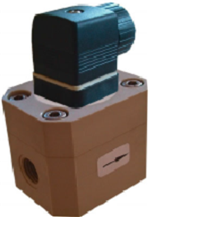 The flow sensor housing is available in different material combinations such as PP, ECT-FE or stainless steel, with the oval wheels made of PEEK. The availability of different oval-wheel axle shafts and gaskets allows the DOZ01 to be compatible with the widest varieties of liquids. The device offers two measuring ranges (2 to 10 GPH / 8 to 40 l/h and 3.7 to 21 GPH / 14 to 80 l/h).